From Goodreads: The third book of the Sandman collection is a series of four short comic book stories. In each of these otherwise unrelated stories, Morpheus serves only as a minor character. Here we meet the mother of Morpheus's son, find out what cats dream about, and discover the true origin behind Shakespeare's A Midsummer's Night Dream. The latter won a World Fantasy Award for best short story, the first time a comic book was given that honor. This volume includes issues 17-20 of the original series and features completely new coloring, approved by the author, of issues 17 and 18. 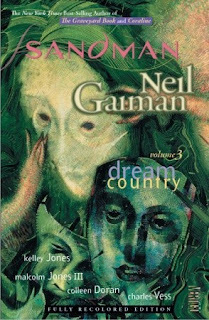 Thoughts: Dream Country is the third Sandman volume. It has 4 self contained stories that involve the Sandman. The first is about the imprisonment of a muse - Calliope who also happens to be the mother of the Sandman's son. The second is What Cat's Dream about and I don't believe a word of it! The third explore the other world origins of A Mid Summer's Nights Dream and the last is about the façade we present to the world. I think I prefer the continuous stories presented volumes 1 and 2. There was a little disjointed for me, although Gaiman's explanation at the beginning was interesting. Dream Country gets 3 stars.